Love cats or kittens? 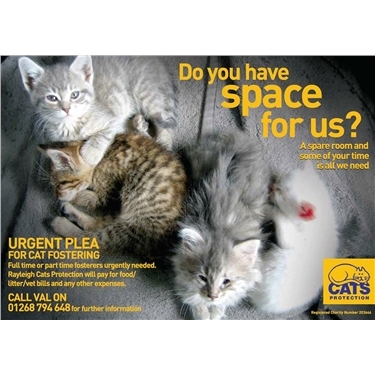 Want to make a difference and help a homeless cat or kitten? If so, we always need foster carers who can look after a cat (or two!) until we can find them a new home. We will pay for everything - all you need is a room that the cat can stay in and which is separate from any other animals. You don’t have to be able to drive - we have people who can help with any trips to the vet required and you will be part of a friendly team of volunteers. Why not give it a go? You will be making a huge difference to cats in this area and changing a cat or kitten's life for the better. Please come and join us.